Cornelius J. (C.J.) Harris, CBI, M&AMI is the President and Managing Director of C.J. Harris and Company, LLC. C.J. Harris' leadership of the firm is based on over 45 years of business experience including sales, retail management, manpower development, commercial banking, management consulting, and private investment banking. He was the first in North Carolina to meet and exceed the requirements to be designated a Certified Business Intermediary by the IBBA. In 1999, he received the Fellow of the IBBA designation. In 2002, he and twelve other candidates were the first candidates to earn the M&A Source designation of Merger and Acquisition Master Intermediary (M&AMI). As a charter member of the IBBA, C.J. Harris served on the initial Standards of Practice, Bylaws and Code of Ethics Committee. Additionally, he has served on the IBBA International Committee and on the M&A Source's M&AMI Credentials Committee and Marketing Committee. As a charter member of the CVBBA, he was elected as a three-year member to the Board of Directors, serving as chairman of the Bylaws and Code of Ethics Committee. C.J. 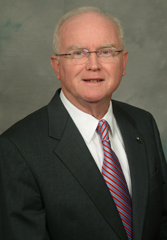 Harris served many years as an advisory member of the Advisory Board of the North Carolina Small Business Technology Development Center, first as an advisory board member of the Easter Region, then as chairman, and as a state-wide advisory board member. At the University of North Carolina, Chapel Hill, C.J. Harris earned a Bachelor of Science in Business Administration. He has kept abreast of the changing concepts, technology, markets, and professional practice by continuing his education in graduate studies at East Carolina University, University of North Carolina - Chapel Hill, Rutgers University, in addition to intra-company and associational continuing education programs. C.J. Harris has taught collegiate courses in accounting, economics, finance, and real estate. He served a number of years as a lecturer at The Annual Conference on Entrepreneurship, Fuqua School of Business, Duke University. In addition to his role as President and Managing Director of C.J. Harris and Company, LLC. C.J. Harris actively participates in business brokerage, mergers and acquisitions, business planning, capital planning and placement, business evaluations, and continuing education projects. C.J. Harris has served our clients as a business valuation expert witness in judicial cases. He has conducted seminars and workshops on business planning, business valuation, profitably selling a business, and succession management. Martina Fairley serves as the Director of Client Services. She, functionally and operationally, leads the Company in the areas of marketing, client services, buyer services, and administration. As team leader and facilitator, she is project and task oriented, has exceptional interpersonal, research and analytical skills. Before joining C.J. Harris and Company in 2005, she was employed as an Office Manager for Alcatel-Lucent in Stuttgart, Germany for 10 years, with active management over 200 employees at all times. A brief hiatus from C. J. Harris and Company in 2011 and 2012 lead to a position as a Consultant for two years with North Atlantic Treaty Organization (NATO).